As a measure of the industry&apos;s health and future, the sixth annual Marine Industry Career Day at the International Yacht Restoration School was another sign that prospects are improving. "I&apos;ve attended every one of these career days and this one was by far the strongest I&apos;ve seen," says Karl Nordstrom, human resources director for New England Boatworks in Portsmouth, R.I.
"This was the first year in a while that you could feel the energy coming back," says Susan Daly, vice president for programming at Newport, R.I.-based IYRS. The open house brings industry members from the state and region together with people seeking careers in the marine field. This year&apos;s event, held March 5, drew a diverse collection of companies - builders, restorers, boatyards and businesses at the leading edge of composites technology. Organizers say the opening of the IYRS marine systems program in 2007, in part, influenced the diversity. 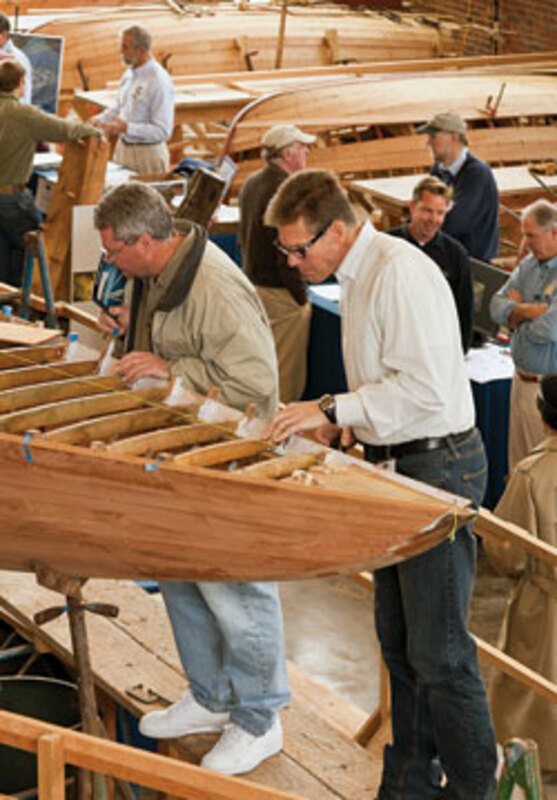 The school also offers a composites technology program and its mission program, boatbuilding and restoration. A strength of the academic programming is the substantial involvement of the Rhode Island Marine Trades Association in curriculum development. About 40 of IYRS&apos;s 60 students will graduate in the spring, trained in the skills the industry continually says are a top priority. "Beyond the training, we try to build in our programs the old adage of work ethic," Daly says. "It&apos;s teamwork, problem solving, troubleshooting - it&apos;s more than showing up for work each day and I think employers are seeing that in our graduates." Clark Poston, director of student and industry relations at IYRS, says the event&apos;s reach is multifunctional - promoting career placement for graduates and addressing the industry&apos;s need for skilled labor, while promoting the marine trades to the public. "I&apos;m seeing a pretty optimistic uptick in the industry," Poston says. "They&apos;re not looking to add 20 employees, but they&apos;re looking to add one or two or three. It&apos;s modest, but it&apos;s there and wasn&apos;t last year." Last year, nearly all of the approximately 40 members of the class of 2010 found industry employment right out of school. "And all eventually found employment or continued on with school," he says. Nearly 30 companies from Rhode Island, New York, Connecticut and Massachusetts set up booths at this year&apos;s career day. 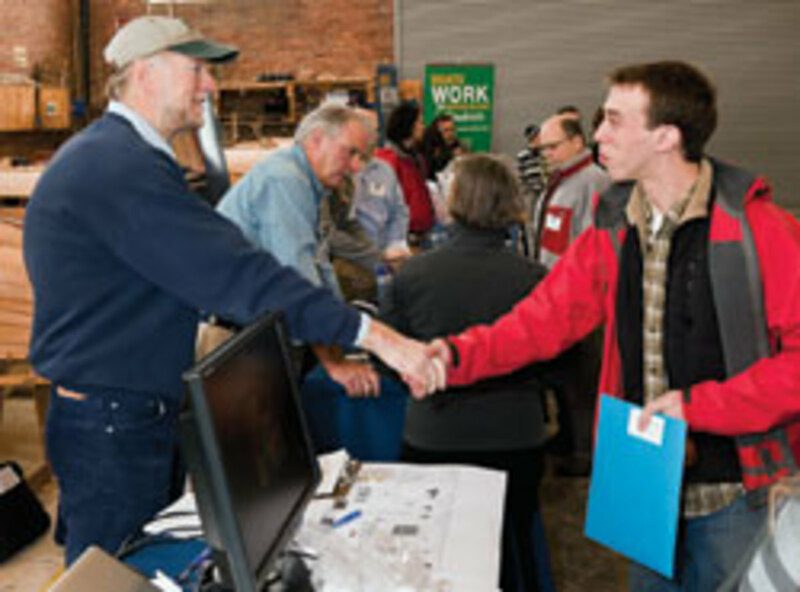 About 150 people used the event to speak with employers and pursue options for careers. Several companies told organizers they were more optimistic about adding jobs amid signs that the marine industry could be emerging from the recession, noting an uptick in hiring in the fourth quarter of last year. "In 2010, we saw a hot-and-cold trend in hiring," says Neal Harrell, president of Brooks Marine Group, which recruits managers and skilled technicians for marine companies looking to hire. "There were spikes of activity, then dips ... but in the fourth quarter of 2010 we started to see quite an uptick in the hiring front. That has carried over into 2011 and right now what I see is an all-out war for talent." Representatives of several builders and boatyards say they are considering new hires after job freezes or layoffs during the recession. Andy Tyska is president of the full-service marina Bristol Marine, a boatbuilder as co-owner of Bristol Harbor Boats and a Hunter Marine dealer through his Fleet Yacht Sales. This was Bristol Marine&apos;s third year at the open house. "It&apos;s a great opportunity to meet qualified candidates who take the time out of their Saturday to attend," says Tyska, who is also a Rhode Island Marine Trades Association board member. "It&apos;s also a chance to network with other people in the industry." Tyska says Bristol Marine recently hired a yard worker and is looking to add a painter - but a versatile one. "We no longer hire people for specific positions. We&apos;re hiring people with a diverse set of skills who are willing to learn new skills," he says. Of his three businesses, Tyska says the yard fared best during the recession and is showing signs of recovery. "We&apos;re seeing people reinvest in the maintenance of their boats so they can enjoy them," he says. "And we didn&apos;t see as much of that in the past two years." Wendy Mackie, executive director of Clean the Bay, a non-profit group dedicated to removing debris from shorelines and waterways, attended the open house for the third year. "Clean the Bay has had great luck with hiring from the attendees of this event," Mackie says. "In fact, half of our staff has been hired through Career Day, including our manager of operations, Capt. Joe Mariani." Mackie praised the quality and commitment of the employers and the attendees. "And it seems to get better each year," she says.